Jennifer is skilled at leading and following. Please join me in welcoming Jennifer Olson to the Bay Area. 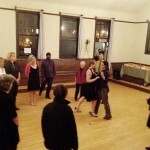 Jennifer is an accomplished tango teacher, performer and DJ who rose up quickly her Tango career. She is originally from Portland, Oregon, and through her passion for Tango, has taught and danced all over the world. Jennifer has recently moved to San Francisco and was generous enough to agree to an interview, so we can all get to know her better. Through this interview and meeting her in person, I’ve learned she is not only a very talented dancer (check out her pivots and excellent musicality) but also a very sweet and open person. We are lucky to have her. SFLovesTango: I understand you have traveled a lot in your Tango career. Where in the world is your favorite place to dance? Jennifer: Buenos Aires, Argentina of course! It comes down to a numbers game – not only are there more people dancing in Bs. As., there are more people traveling through Bs. As. on a regular basis as well! You have all the major tango circuits running through the city – obviously the Argentinians, but also the Europeans and Americans as well. The interesting thing to me is that they all dance very differently. No one way is necessarily better than another, but they all have certain elements that are emphasized in their dance. It’s the best of all worlds when one is in a location that mixes people from all over the world. SFLovesTango: Where in the United States have you lived? Jennifer: I have lived in Portland, OR; New York City, NY; Seattle, WA; Buenos Aires, Argentina; and now, San Francisco, CA. 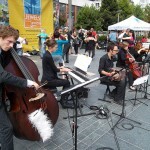 SFLovesTango: Which of these is your favorite US city for Tango? Jennifer: This is a difficult question, but if I had to choose just one, I would say Portland, OR. I would choose Portland because I feel that the community there fosters an environment that does not involve too many politics and really emphasizes the important things (such as comfort, connection, and musicality). 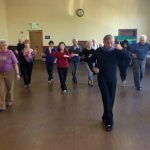 Of course, there are always little beefs in every tango scene, but by and large, the Portland community does a great job with putting things aside for the benefit of everyone in the community. For example, when I first started dancing in Portland, all of the instructors really encouraged their students to take classes from other instructors as well. 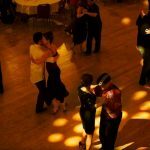 I think this is fabulous as it leads to a greater understanding of tango (which keeps people in tango and grows the scene) and it also encourages creativity of one’s own, instead of simple replication – the individual, confronted with sometimes conflicting information, needs to decide what tango means to him/her. SFLovesTango: How did your journey begin? What was your profession before you got involved in Tango? Before I started dancing tango, I was in high school. My first encounter with tango was literally the weekend after I graduated from high school. The only other job that I have ever had aside from teaching tango was as a swim instructor and lifeguard while in school. SFLovesTango: What have you been doing in the past 5 years? Jennifer: In the past 5 years, I have been traveling around the world teaching and dancing up a storm! Up to this point, I have taught in 19 countries and lived in Buenos Aires for a total of two years. As for a few moments in history: In 2008, I actually achieved one of the pinnacles of my career – teaching at the Mallorca Tango Festival in Palma de Mallorca, Spain with Damian Lobato. It was a momentous occasion for me as I was teaching at a festival with the likes of Chicho Frumboli and Juana Sepulveda, Sebastian Arce and Mariana Montes, and Fabian Salas! On top of that, in 2011, I also taught at the Agosto Festivalito put on by El Yeite Tango Club in Buenos Aires, Argentina with Martín Bel. I was the only foreigner to teach at the festival. SFLovesTango: Which maestros have inspired your style? Jennifer: Alex Krebs has, by far, had the most influence in my dancing and teaching but I have also been greatly influenced by all of my dance partners: Robin Thomas, Damian Lobato, and Martín Bel. Damian and Martín have both been influenced greatly by Chicho and Gustavo, and so a lot of how I understand the dance and my philosophy of the dance actually originates from them. 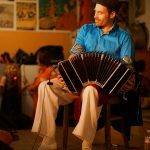 SFLovesTango: What is your favorite Tango Orchestra? Jennifer: My favorite tango orchestra, by far, would be that of Carlos Di Sarli. The music of Carlos Di Sarli is incredibly varied depending on the decade in which the piece was recorded. It would be possible to play half a night of Di Sarli and still keep the flow going strong – from “Big” Di Sarli instrumentals recorded in the late ’50s, to “Romantic” Di Sarli with Podesta in the the mid ’40s, there is really something for everyone with an orchestra like Carlos Di Sarli. 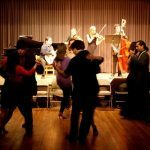 SFLovesTango: From the perspective of a dancer, what is crucial for a dance (in a milonga) to be fulfilling? Jennifer: For a dance to be fulfilling for me, the embrace must first be comfortable and connected. After that, it is all about musicality. Musicality is what makes the dance interesting. It holds my attention. A metronome is not interesting no matter what complicated movements one is doing. 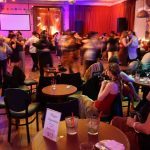 SFLovesTango: How often do you social dance? Jennifer: I actually still really enjoy going out social dancing as I love getting to know new people. While at times my body can’t physically keep up, I like the energy in the dances and hearing people’s stories. Because of this, I try to go out dancing as much as possible. I would say that I end up going out about 3-4 times per week. SFLovesTango: What are the most important fundamentals you hope your students learn from your classes/workshops? Jennifer: I think the most important thing that I can try to communicate to my students is how to “dance” and not simply “move.” I frequently look out on the dance floor and see people “moving” and not “dancing”…dancing is a whole other ballgame. It’s not easy and it takes a lot of vulnerability, especially as a follower. Of course, it is incredibly draining and is not possible to do all the time, but I would like to see more of this. It is not necessary to know “steps” to do this. Some of the most amazing dances that I have had were not much more than walking and weight shifts as far as the movements were concerned. 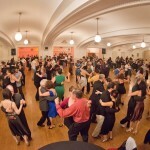 SFLovesTango: In the future, do you picture your life dedicated to Argentine Tango? Jennifer: What else would you like to achieve as a professional Argentine Tango dancer/teacher? I definitely see tango in my future although I can imagine that it might take more of a backseat once I start a family, etc. I really love tango people – they tend to be very open-minded, intelligent, and a culturally diverse bunch, so I appreciate these kind of people in my life. As far as the future is concerned with respect to teaching tango, I really just want to inspire more people/introduce people to tango. I love teaching beginners for this reason. 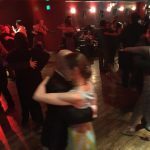 I remember a former student of mine that recently contacted me… She started tango with me in Seattle and emailed me as she wanted to let me know that she moved to Rome and is completely addicted to tango. I like that…I have influenced her life. That makes me happy. SFLovesTango: You will be teaching with Felipe Martinez TWO special workshops on Saturday, September 8th at La Pista. Tell us more about it. Jennifer: Felipe and I will be teaching two workshops, Pivots and Boleos from 1 – 2:30 pm and Turns, Sacadas, and Ganchos from 2:45 – 4:15 pm. Each workshop will consist of a brief review of some foundational technique that will then segue into the highlighted movements – boleos in the first workshop, and sacadas and ganchos in the second. The foundational technique that we will review will be integral in the achievement of the movements. The classes are for an advanced level, so expect them to be challenging!